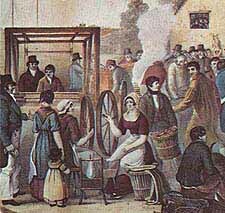 In 1811 John Coxeter a mill owner in Newbury, Berkshire (UK) boasted that so improved was his machinery he could certainly start with a fleece and make a coat in a day. 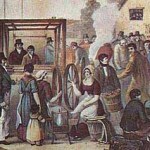 On June 25, 1811 the first sheep to coat challenge was completed. 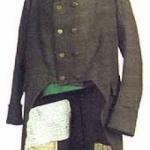 It produced what is known today as the Newbury Coat. 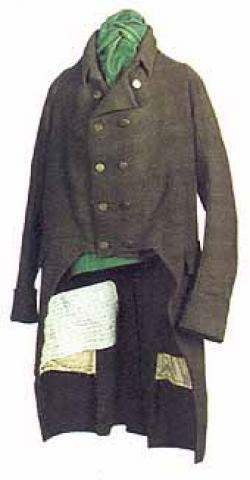 The garment (pictured below) still exists and is displayed at Coughton Court in Warwickshire– a testament wool’s sturdiness! Since the Newbury Coat, sheep to garment challenges have become annual events at at county shows, fiber festivals and guilds. Mostly it’s all in good fun, but there are some who take it all a bit more seriously. The Guinness world record time for a sheep to sweater challenge–4 hours 51 minutes– was set back in 2004 by Australia’s Merriwa Jumbucks at Merriwa, New South Wales. Last year Norwegian spinners and knitters attempted to break the record on live television, but fell a few stitches short. Those Aussies are hard to beat. 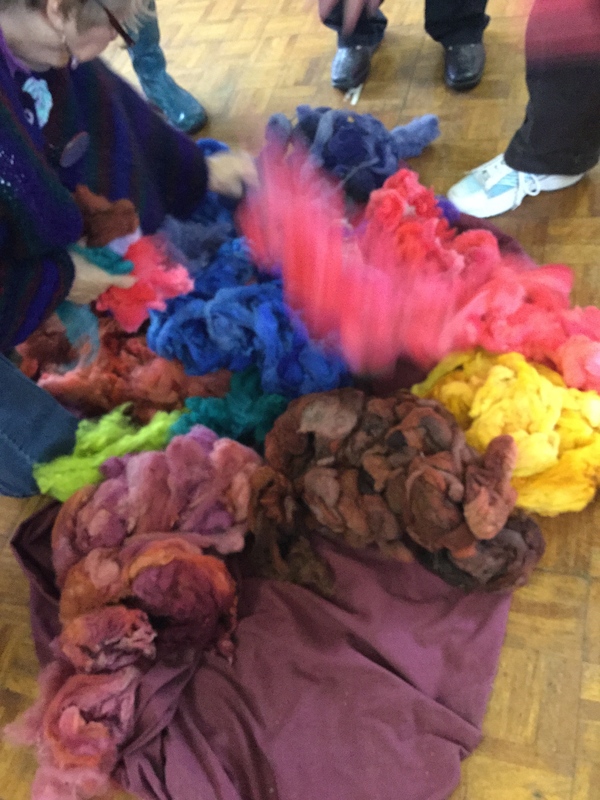 Last Saturday my guild–The Mid-Essex Guild of Weavers, Spinners and Dyers ran a slimmed down version of the sheep to sweater challenge.One of the guild members supplied and dyed the fleece from her flock of Southdowns. 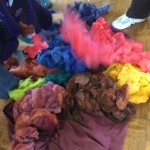 We broke in to teams of five and started with uncarded, dyed fleece to create two scarves per team in about 3 1/2 hours. It’s not as easy as it sounds. Half-way through the challenge we could have used a visit from a massage therapist! There was a bit of inter-team trash talking…. well not really. Mainly we were sounding out strategy–such as how much yarn we needed to cast on 120 sts onto 8mm needles, should we be carding or spinning straight from the pile of fleece and should we ply from a center-pull ball or navajo ply? Luckily I was on a team with a bit of experience. 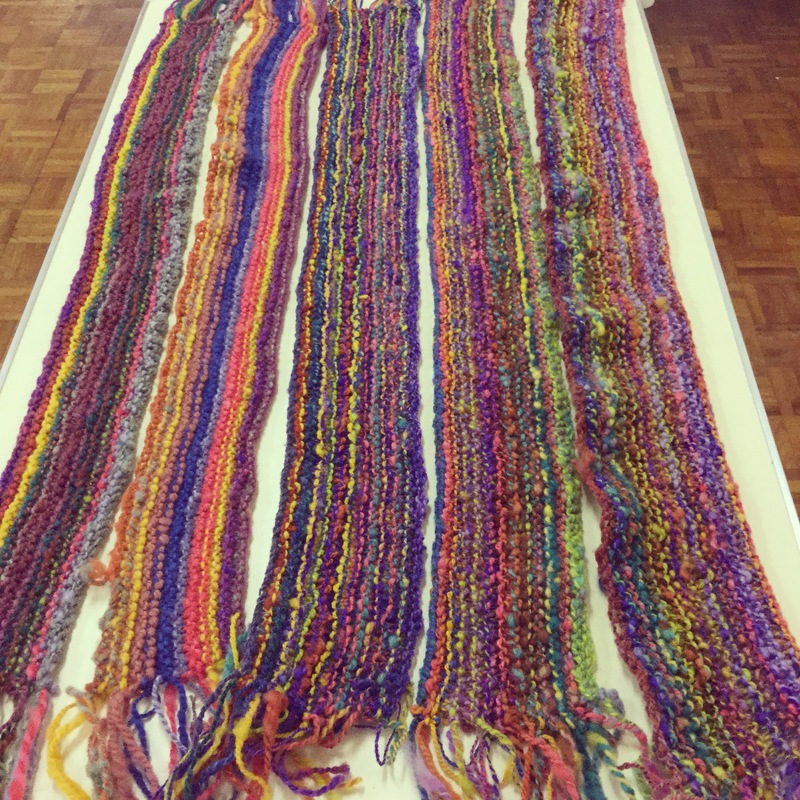 One of my team mates had done a test run at home–something that never occurred to me!–and had a rough idea of how much yarn we needed to start knitting. Once we had spun and plied enough yarn to cast on, the knitters dove in and did their thing. I mostly did spinning, but at the end knitted about five rows and cast off. Lo and behold we had finished two scarves. Talk about crafting on the fly. Phew!! 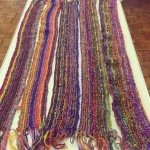 … three & 1/2 hours later Scarves!! I didn’t realize there was an historical precedent for these types of challenges…I clearly need to look into the history of the wool industry a bit more. Your finished scarves are fab. Great idea to knit them lengthwise so that the ends become the fringe. Although, ugh, that’s a long row! Oh yeah, that was a long row. The knitters definitely had the toughest job. They were real troopers!